Over the years I’ve had many great employees, and Sashi Moorman was the first of them. When I first met Sashi he was a chef in New York who had recently caught the wine bug. He had tried an Ojai pinot and liked it a bit, so of all the wineries and winemakers in the world, he visited me in 1995 and asked for a job. Helen was pregnant with Henry, our second son, and I saw that she wasn’t going to be able to help as much in the coming vintage, so I hired Sashi. Sashi was hardworking, opinionated, and creative, so naturally he went on to make great wines on his own. I’ve always called him my “starter employee,” not because of any deficiencies on his part, but because he suffered through having me as a boss before anyone else. Some of my rough edges were worn off on him, no doubt. We made a lot of wines together, and one was a blend that we called Apricots. It was an interestingly different wine we made with Zinfandel grapes from the old K.B. Hall apricot ranch in Upper Ojai, plus some Syrah fruit from neighboring Roll Ranch. 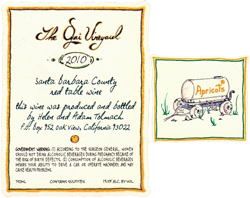 We made these in 1995 and 1997, and Sashi came up with a beautiful label. The wine was fascinating because it had a bit of the structure and feel of an Italian wine—bright, tannic, and very food friendly. This contrasted with the rich oaky wines that were trending at the time in California (especially when you’re talking Zinfandel). It was pointless to submit the wine to the critics, they just wouldn’t get it. But our customers enjoyed Apricots, and dang, the wine aged well—it’s still drinking great! Unfortunately, grapes weren’t the priority at Hall’s apricot ranch, so we weren’t able to repeat the success we had with the Apricots wine. Through the years I hankered to bring back the concept of a lighter, livelier counterpoint to our robust Syrahs, and inspiration came in 2010 when we started working with Sangiovese from White Hawk and Grenache from John Sebastiano. Both wines were particularly aromatic, tart and tannic and together they became something magic, and thus “Apricots” was born again. It’s only taken me 5 years to get the label printed, but it’s been enormously good for the wine, as this one (like many of us) has needed lots of time to smooth out its rough edges. When you first take a whiff a scent of cranberry or possibly apricot greets you, and that’s followed by an overlay of earthy sandalwood—and lots of that exotic intensity from the cool 2010 vintage. The flavor of mouthwatering tart berries hits the tongue first, then brisk tannins, and then a rich, lingering raspberry aftertaste. Wonderful to contemplate and even better to enjoy with rich foods. And like the 1995 and 1997, this one will age gracefully for years.